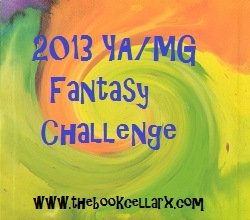 Books can be any YA or MG fantasy, they do not need to be specific to 2013. I will still be doing roundups of releases each month just to keep news up on new releases. Giveaways are no longer just for reviews – they will be for all challenge participants. Reviews will be worth the most entries and each giveaway will be run bimonthly, so there will be 6 prize packs available throughout the year. Now this is a challenge right up my alley. It seems I read more YA books all the time. Completed challenge on March 30, 2013.